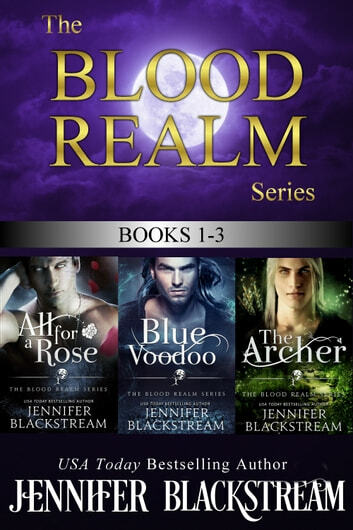 Get three full-length novels from USA Today bestselling author Jennifer Blackstream for the price of two! Three captivating paranormal romances to make you swoon, make you laugh, and maybe make you cry (in a good way). Watch a dragon shifter, a lightning-kissed pirate, and a mischievous archer find the strong-willed mates that will drive them to realize their full potential and become the powerful men they need to be to fulfill their secret destiny... Each spellbinding story comes complete with incredible magic, dark curses, and a fairy tale ending that will give you the happily ever after your heart needs. Maribel traded her life for her father’s, resolving herself to a life as the prisoner of the half-mad dragon lord no one ever sees. Can she get through to the man behind the beast? Or will her captor turn away from a chance at love to get the revenge his dark temper demands? Dominique Laveau is a powerful voodoo queen, a far cry from the passion-blind woman who took a pirate to her bed for one wild night. With her shame behind her, the last thing she expected was for the pirate to return ten years later with a demand for her help…and her hand in marriage. Marian is off the hook for murder, but she’s never been in more danger. The tempting trickster who saved her won’t rest until he discovers secret, and if Marian satisfies her own desires and her partner in crime’s curiosity, it might just get them both killed. Wow! Very interesting and clever take on fairytales you know. Really liked her version of these fables. Definitely worth reading!